9:00 A.M. to 5:00 P.M. Doors open at 8:30 A.M.
Public Parking: The municipal parking garage is located at the intersection of Bank and Grand Streets. There is also an entrance on Field Street, which is off of Grand Street and on the side of the City Hall building at 235 Grand Street. Limited free public parking for court customers is also available in the courthouse ramp garage, located on State Street, next to 400 Grand Street. Metered parking is available on Grand Street. 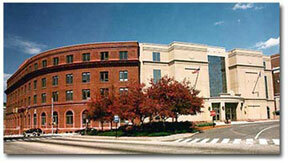 Juror Parking: The Judicial Branch provides parking for jurors at the municipal parking garage located at the intersection of Bank and Grand Streets. There is also an entrance on Field Street, which is off of Grand Street and on the side of the City Hall building at 235 Grand Street. Handicapped Parking: Five handicapped parking spaces are available on State Street on a first-come, first-served basis. State Street is a one-way street. Access to State Street is from Grand Street. Four handicapped parking spaces are available on a first-come, first-served basis in the courthouse ramp garage, located on State Street, next to 400 Grand Street.